It’s that time of year! Garden time. 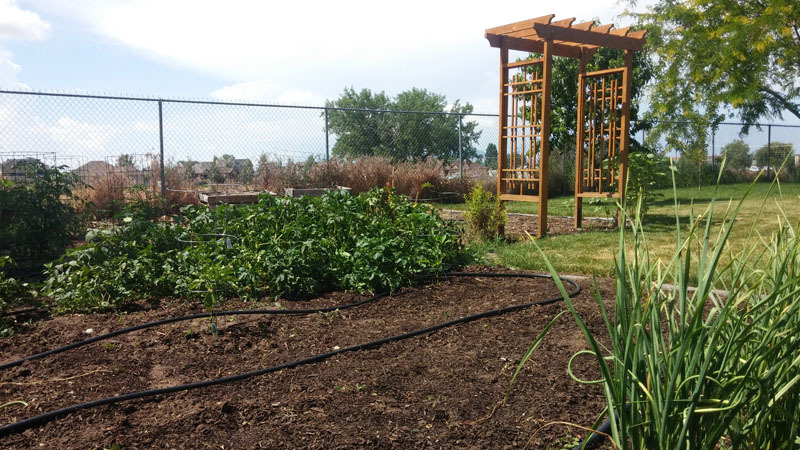 Here in Utah we plant our summer garden in the beginning of June and typically have produce to pick until late September. So we just planted our garden a couple of weeks ago. Not a lot is happening yet, but I still wanted to share our simple garden plan. We’ve lived in this house for about 2 1/2 years. This year we amended the soil with a fertilizer from our local nursery and it’s made a huge difference. You can see the process in the photo above. You can also see two varieties of garlic and two varieties of onions that were started last year. Here’s what the space looked like one month later. Lettuce has popped up and the onions are ready to be dug out to make room for carrots (rainbow and nantes) and radishes. The above photo shows what the space looked like after we pulled the onions (which we hung up to dry.) The carrots and radishes will start popping up in about two weeks. The garlic will stay in the garden indefinitely. I’ll just dig up what I need to cook with and continue to divide the cloves of the rest to produce more garlic. Grow What We Can Eat – I’ve made the decision not to worry about preserving many things this year because I’m simply too busy and I want to focus on other things. I may do a bit of freezing, but I won’t be doing any big batches of canned goods. What we don’t eat, we’ll give away to friends and family. 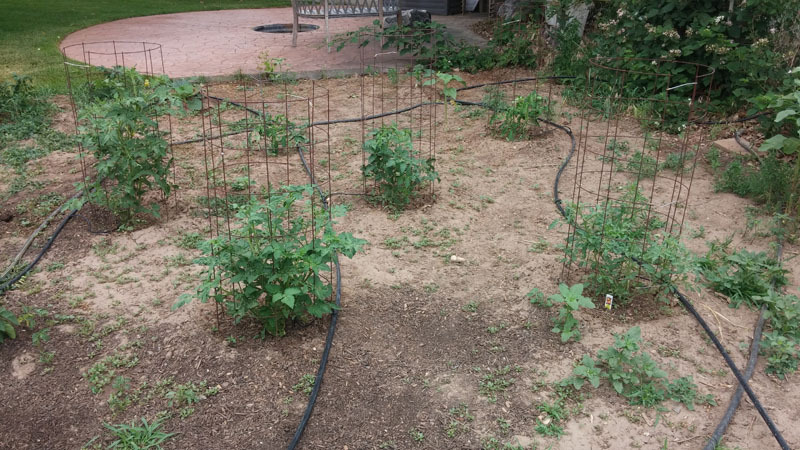 The photo above shows our tomato plants and drip line. 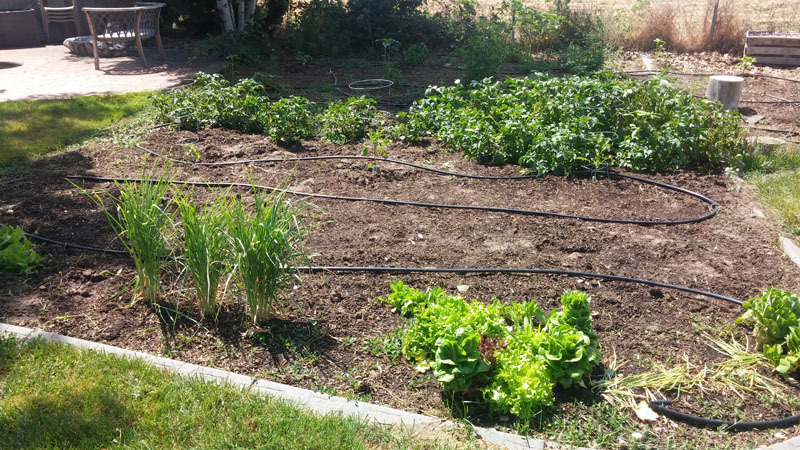 The drip line cuts down on weeds and saves water. 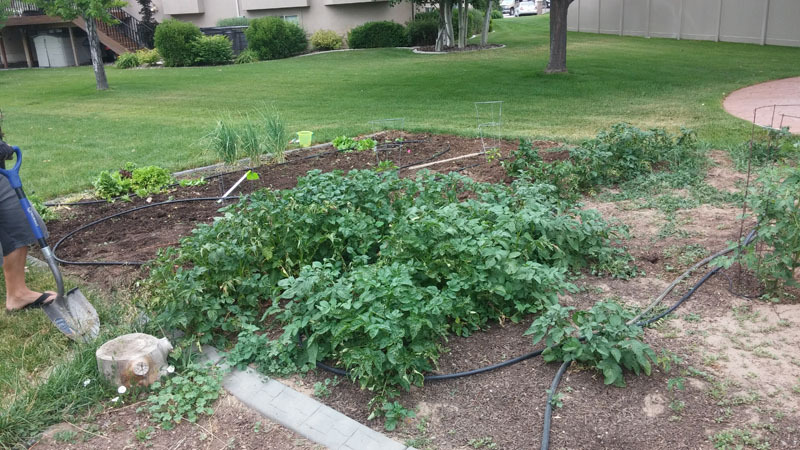 The photo below shows our potato plants. Last year I was lazy and didn’t dig out all the potatoes. So these are actually volunteers from the potatoes we left in the ground. I didn’t plant anything new. Work With What We Have – In my dream world we’d have a lovely potager style garden with raised beds. 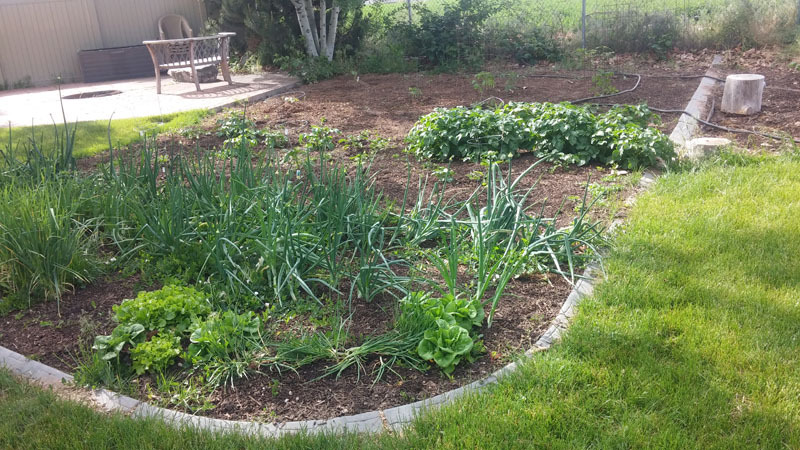 Our current house has an existing garden bed that we’ve been planting in for the last two years. We talked about building raised beds this year but because we don’t have plans to grow old in this house, we have decided to keep planting in the existing garden for now. There is a small bordered space just to the west of the existing garden (where the arbor is situated). The previous owners put their trampoline there. We use it as garden overflow. We have rhubarb, pumpkins, and squash planted over there. Anything that vines is planted over there so it has plenty of space to spread out. I won’t lie, a garden can be a lot of work but it doesn’t have to be. We are guilty of taking on way too much in the past. Little by little, we are learning what our limits are. 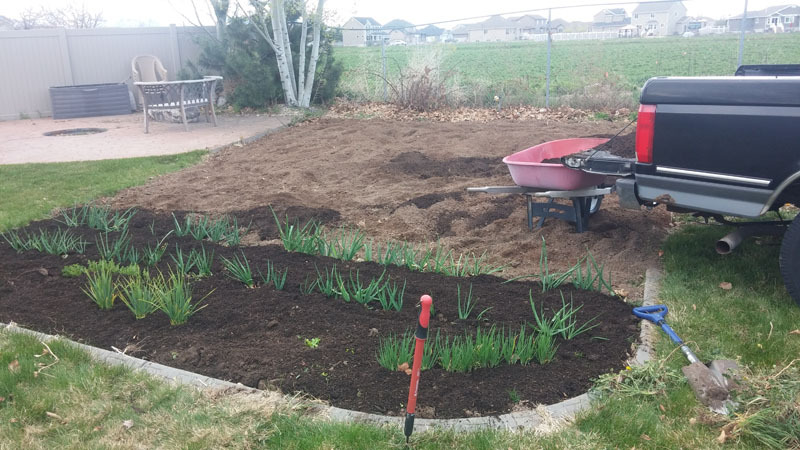 The bottom line is that I actually enjoy gardening, getting my hands in the dirt, and eating what we grow, but it has to be manageable or my hobby quickly becomes a chore. Do you garden? 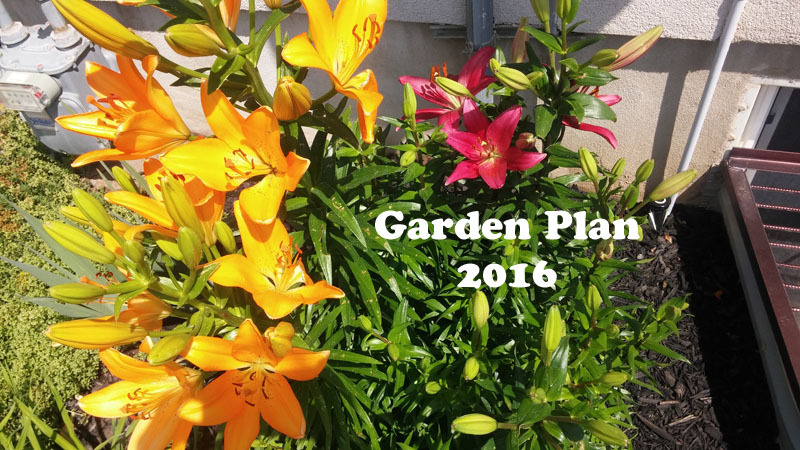 What have you planted this year?